Pavers offer infinite design possibilities for your landscape. They can be used for walkways, driveways, patios, pool surrounds and many other ways. With hundreds of sizes, styles and colors and patterns available there is something available to enhance your home. Paver Walkways – Provide an inviting first impression and produce an interesting transition from one space to the next. 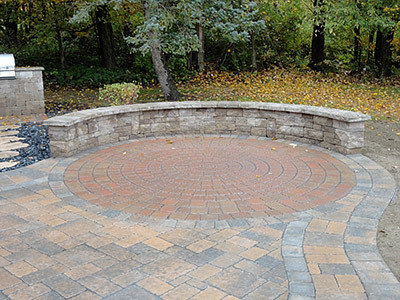 Paver Patios – Provide an area where people can gather and enjoy their backyard and the outdoors. If your yard contains hills or sloping areas a retaining wall can help stabilize the landscape and make the space more usable. Retaining walls can also help with water management on your property. 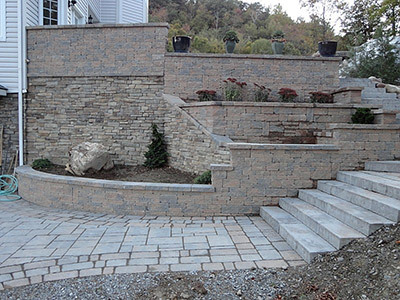 Several materials can be used to create a retaining structure including natural boulders, block walls with veneer, segmental block walls or natural stone.